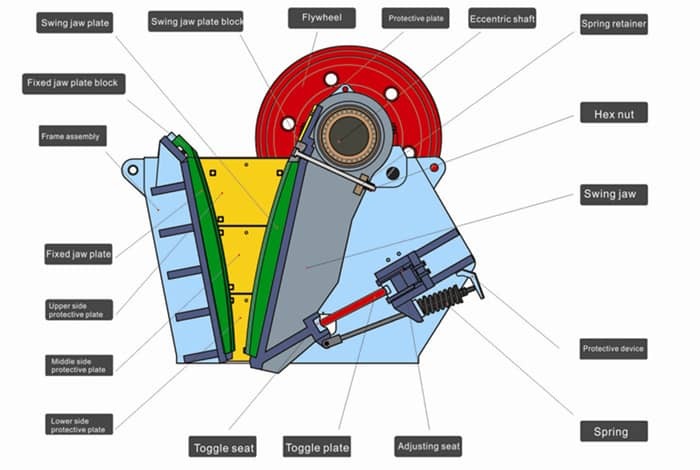 During the usage of the jaw crusher, jaw plate directly contacts with the materials, which generates great crushing force. During production, the teeth of jaw plate receive the squeezing force, grinding and impacting force from the materials, and the huge impacting load leading the jaw plate wear seriously. Once the jaw plates worn out completely, the jaw plates will lose efficacy and the machine breaks down that directly influence the enterprise working efficiency and economic benefits. So what are the factors that affect the wear of jaw plate? 1. Nature of materials. The nature of crushed materials cannot be changed or selected, such as the material hardness, water content, and viscosity, etc. 2. Jaw plate texture. The texture of jaw plate can be selected and changed. The jaw plate bears the abrasion and cutting force from the materials, it needs have high hardness and toughness. 3. Movement of jaw plate. This determines the relative movement and force condition in the process of materials crushing and discharging.